My journey to financial independence - niterainbow.com: June 2012 update ($188,475 -$300 or -0,16%). ↑I have invested $55 K from the cash pot left for investments. I consider this as positive, as position was stable but have not generated any meaningful growth so far. ↓ Emerging markets lost 5% of their value. 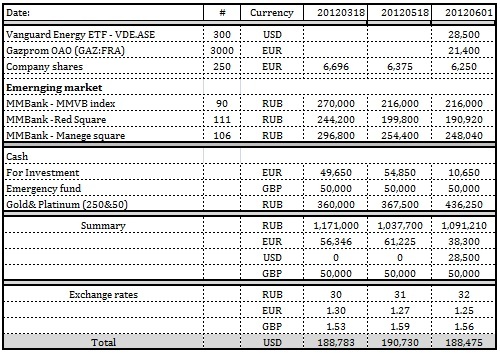 - Some of the negative return is due to EUR lost 4% and RUB lost 7% to USD from March. In real terms I invested $6,6 K but my nest egg has dropped by $300. - My cumulative loss in emerging markets $4,8 K.
- My cumulative loss due to EUR slide is $3,2 K.
- Cumulative gain due to GBP strengthening is $1,5K. In overall I am glad that I diversified my portfolio - currency and structure wise. That is one heck of a gold warchest! How come you denominate it in RUB? I happened to work over there at the time. I thought it is good opportunity to invest in one of the BRICS countries.